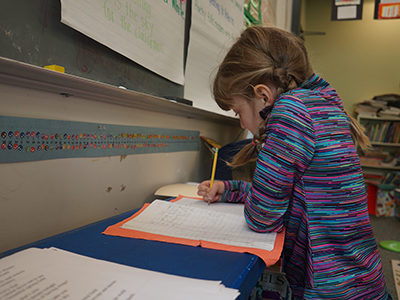 The focus of our Language Arts program is to empower children to read, write, speak, listen and think for authentic purposes. We hope to nurture readers who enjoy losing themselves in a book, construct meaning from texts, research information and think critically about whose voice is heard and not heard. 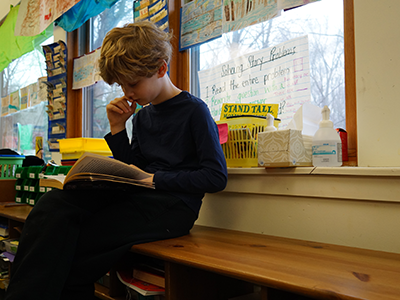 At Miquon, Language Arts experiences are integrated throughout the day, as children have the opportunities to exchange ideas, listen and respond to one another and interact with texts in all subject areas. Our intention is to foster intellectually curious, independent thinkers who use literacy to make sense of the world, while also advocating a better life for all. Children learn at a very young age how what we say can be written and read by others. At Miquon, we emphasize how the power of our voices, enable us to share our individual stories, question the inequities in society, and spark change. 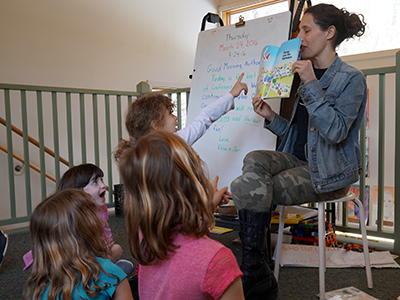 Children are immersed in language at Miquon, through play, songs, poetry, interactive read alouds, independent explorations of children’s literature and opportunities to explore writing in meaningful ways. Explicitly and implicitly, the children develop their oral and written vocabulary and learn the decoding and encoding skills needed to construct meaning, to communicate their ideas and stories to an external audience and to reflect upon their own learning. Throughout our literary discourse, children are encouraged to think critically about the texts and to consider different perspectives. 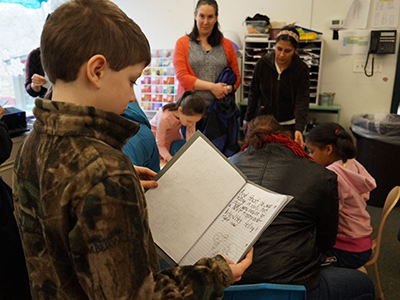 A multidisciplinary approach encourages our learners to see the connections between reading and writing and to use their literacy skills in all domains. 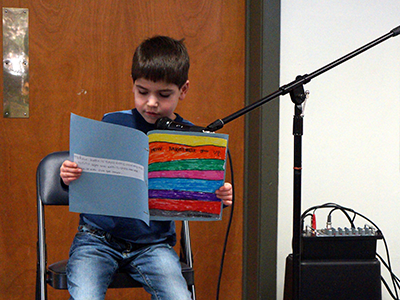 From Nursery through Sixth Grade, children participate in interactive read alouds, as they are encouraged to share their interpretations throughout their interactions with the stories. Children make predictions, connections and inferences, while using the text and their experiences to support their thinking. Our readers also learn to raise questions to help make sense of the world and see things from another person’s perspective. Read alouds are consistently rich in discourse, exposing our children to extensive vocabulary and expanding their ability to communicate effectively. Beginning in First Grade, learners meet in guided reading groups where teachers model reading strategies and guide children in thinking critically about what they read. During reader’s workshop teachers work one-on-one with children using “just-right” texts to further their integration of reading strategies and skills that secure comprehension and develop reading fluency. Across all of the grades at Miquon, teachers intentionally and thoughtfully choose rich literature to examine how authors effectively communicate their purpose in an engaging way. 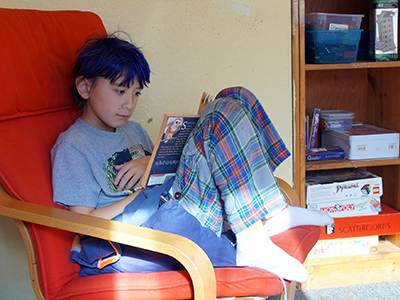 Older children meet in literature circles, often reading books of their own choice, participating in thoughtful conversations about theme, author’s purpose and perspective, and again, personal connections that enrich their experiences with the texts. With an understanding of the strong connection between reading and writing, we encourage the children to read like writers, so that when they approach a text they learn to ask themselves: “What can I learn from this writer? How can I borrow their writing strategies?” Literature-based writing lessons provide children with models for crafting their own stories. Children begin exploring with writing in Nursery by working in writing centers and creating books to tell their own personal stories. Kindergarteners use journals to record both personal experiences and observations of the natural world. Children also participate in writer’s workshop where they craft and revise writing pieces that elaborate on ‘small moments’ in their lives, create fictional pieces with coherent story lines, and reflect their emerging understandings of different genres. Writing projects expand in the fifth and sixth grades to include more formal research-based projects as well as creative pieces of fiction. 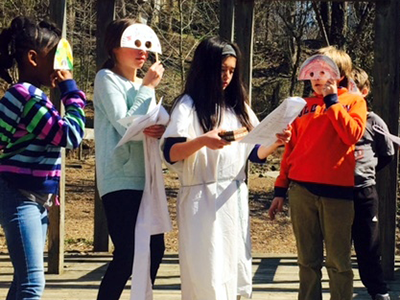 Theatrical performances from First through Sixth Grade are a hallmark of Miquon’s comprehensive and holistic approach to our children’s literacy development. 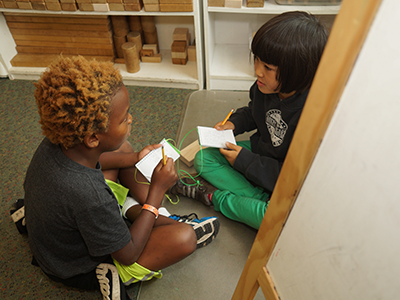 Whether children are dramatizing scenes from stories that they have read, or creating the script themselves, plays exemplify our learners’ facility with language and deep-rooted understanding of the power of stories. 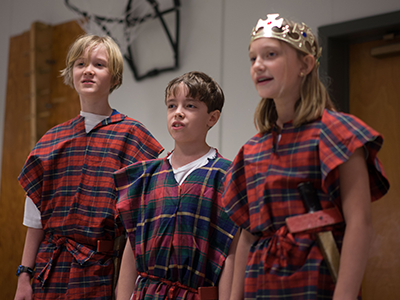 Rehearsals provide an engaging way to develop fluency and prosody while the performances are the forum for our children to grow in confidence, publicly showcasing their hard work. As a result, children who graduate from Miquon not only have the abilities to engage thoughtfully with texts and communicate clearly both orally and in writing, they also have the conviction to challenge what they read and hear, and feel empowered to create their own stories as a way of sharing and connecting with others and the world around them. 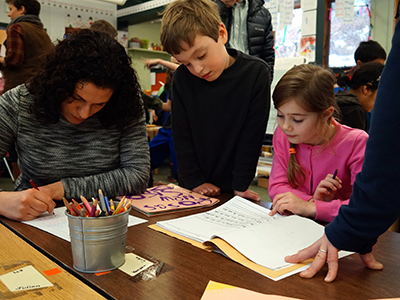 Miquon’s language arts program is aligned with the National Council of Teachers of English recommendations for elementary language arts instruction and maintains a balanced approach to facilitating the development of literate and engaged learners. 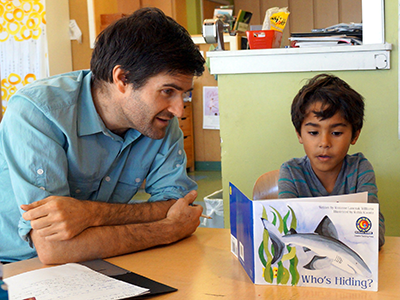 The skills involved in reading and writing, such as phonics, spelling, handwriting, grammar and vocabulary are taught explicitly through programs like Fundations, Sitton Spelling, and Classical Roots, but are also integrated into our children’s experiences with authentic texts and writing for real purposes. The program is grounded in children’s literature but is also rich in experiences with non-fiction and informational resources.